From Oedipus to Samuel L. Jackson's Wallet: And how did your evening go? And how did your evening go? As a slight bit of back story, my phone has been periodically dodgy the last few months, occasionally resetting itself randomly. It'll go for days without doing it at all, and then it'll do it every 2 minutes for a couple of hours. Annoying, but every time I decided to replce it, it went through a good patch, and I convinced myself it wasn't worth it. I've never had any problems with signal. So much for making a car journey that evening. 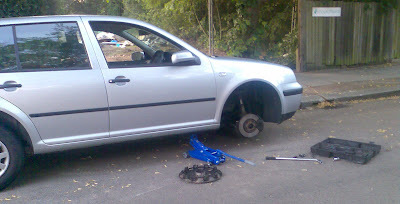 I was meeting friends, so I jumped on a bus and resolved to come back the next evening and get the wheel changed. After all, how long could it take? 6:15 - I leave the house and walk 15 minutes up the road to where the car is parked, only to find I have no signal. I walk in ever increasing circles trying to find somewhere with signal that's also not too far away from the car (since they may need to call me back, if there's a problem, or they can't find me). 6:35 - I find a spot with signal and call my dad to find out where the breakdown membership card is. The signal dies before he can tell me. 6:37 - I find another spot with signal and call again. The signal dies again. 6:40 - I go back to the car and find the breakdown card. I try to call my dad again. The signal cuts out again just as he answers. 6:43 - I finally find somewhere with 4 bars of signal and call my dad to confirm which number I have to call, and make sure I haven't forgotten anything. The signal remains good, but the phone resets itself randomly in the middle of the call. 6:45 - I call back and the phone resets itself after one minute. 6:46 - I reset the phone manually, and watch it carefully - it seems to be behaving ok, so I call the breakdown service. "Hi this is <breakdown service>, how can I help you?" "I was hoping I could get someone to come out and help me with a puncture"
"Sure, no problem, just tell me -"
At which point the phone resets itself. 6:47 - I have a minor loss of composure and only just resist the urge to smash my phone into tiny pieces on the pavement. 6:48 - I start walking back home. 7:00 - I get home and ask my brother if I can borrow his phone. I can, but his phone has no credit on it. He goes to put credit on it. 7:02 - I get his phone, now with credit, and leave the house again, walking 15 minutes back up to the car. 7:17 - I get to the car and lay out all the information I'll need to call the breakdown service. 7:18 - I try to call the breakdown service but realise my brother's phone's keypad is locked and I have no idea how to unlock it. 7:20 - Press every conceivable combination of buttons. Phone remains resolutely locked. 7:21 - I lose composure slightly again and punch the car roof. 7:22 - Try to call brother using my phone, but have no signal. Start walking to find signal for my phone. 7:30 - Find somewhere with signal, call brother. He tells me how to unlock phone, just before my phone resets itself. 7:38 - I get back to car and phone breakdown service. They will be with me "within the hour". 7:39 - I sit in car and wait for mechanic. 8:37 - Mechanic arrives to change wheel. 8:43 - Mechanic leaves, having successfully changed wheel. 8:47 - I get back home, tired, frustrated and mentally constructing a voodoo doll of my phone. Sounds like absolute hell. I have a similar problem with my mobile at the moment but, like yours, it has patches of behaving itself (plus I can't really afford a new mobile at the moment). Luckily it's only cut me off during a more formal conversation (with a temping agency) once, but I did nearly throw it across the room when it did that. Review Round-Up II: "Wall-E", "Cloverfield"
I can't comment on the quality of his cakes. Film Review: "The Incredible Hulk"
Not everyone agreed and the old network stayed alive and is now called Ethereum Classic short ETC. Friends share beds all the time as, like, just friends. That’s not weird. Have you ever, ever felt like this?